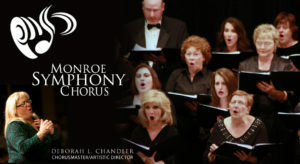 The Monroe Symphony Chorus is a community chorus dedicated to musical excellence, cultivating public interest in quality choral music, and instilling in its members a spirit of dedication and desire to excel as a musician. MSC was organized in 2005 as a non-auditioned choral ensemble composed of both amateur and professional singers from the Monroe area. Through a collaborative relationship with the University of Louisiana at Monroe and the Monroe Symphony Orchestra, the Chorus is under the direction of Dr. Deborah L. Chandler, Director of Choral Activities at ULM. The membership for our first season ranged between 50 – 60 singers and was a cross section of the population of this area. Our membership truly illustrates diversity and fellowship that develops within a group who enjoy working together toward a common goal. Through regular attendance, hard work, payment of dues, and a cooperative spirit, the MSOC can become one of the finest nonprofessional community choral ensembles in the United States. The repertoire of the MSC includes large choral works, octavos of such composers as Handel, Beethoven, Mozart, Rutter, Vaughn Williams, as well as the contemporary music of Broadway, Disney, gospel and spirituals. The chorus will perform annually with the Monroe Symphony Orchestra, Dr. Clay Couturiaux, conductor, and will join often with other choral/instrumental groups. Deborah L. Chandler serves as Chorusmaster/Artistic Director. The Chorus is governed and led by Christine McCaskill and Sara Younger co-chairpersons with Marge Richters and JonEthel Minifield overseeing dues and membership. We meet every Monday evening in the Chorus Room of the Biedenharn Music Building at the University of Louisiana Monroe. Rehearsals go from 7pm to 8:30pm and rehearse on any day except holidays. The MSC is a non-auditioned chorus that is open to community members and music enthusiasts. All that is required is a $25 dues payment each season that you participate.